The Christian Motorcycle Association was built by a group of individual riders with a passion for motorcycling and a passion for serving Jesus Christ. Its vision is to gather as many as possible of single Christian bikers who come from all walks of life to spread the Gospel of Jesus Christ throughout the world and change the world, one heart at a time in the highways and byways. The Christian Motorcycle Association provides spiritual encouragement for Christian bikers to fulfill the great commission as set out by Jesus in Matthew 28:19-20:”Therefore go and make disciples of all nations, baptizing them in the name of the Father and of the Son and of the Holy Spirit, and teaching them to obey everything I have commanded you. And surely I am with you always, to the very end of the age.” So, the primary goal of the Christian Motorcycle Association is to show more and more biker men and biker women the way to Christ and lead them to work better than their past life. Indeed, the members are all bikers who share the love for Jesus Christ and they are willing to win more motorcycle riders to Him. The motorcycles and biker events are used as bait to fish biker men and biker women who are willing to serve themselves to God. The second goal of the Christian Motorcycle Association is to encourage fellowship amongst Christian bikers. It is achieved by organizing kinds of motorcycle rallies, tours, races and so on to allow Christian bikers to attend. And they can help at these events, conduct worship services at these events and serve other single Christian bikers that attend these events. It puts on an annual Blessing of the Bikes during which hundreds of Christian motorcycle riders are prayed over and blessed with food, fun and fellowship. Since God already has someone special for us, the Christian Motorcycle Association is the best place for all single Christian biker men and biker women to meet their spacial one who shares the same love for motorcycle riding and Jesus Christ. Is there anything more wonderful and exciting than dating an ideal Christian biker that you know better in your own group? 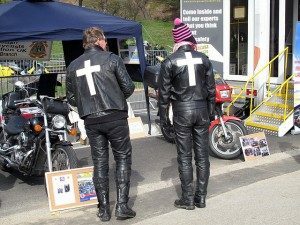 So, come and join the Christian Motorcycle Association to enjoy the family atmosphere, make like-minded friends and share the love for Jesus Christ and motorcycles. As diverse as the membership is, the Christian bikers of the Christian Motorcycle Association have one common goal which is to spread the word of God and to work toward motorcycle fellowship.